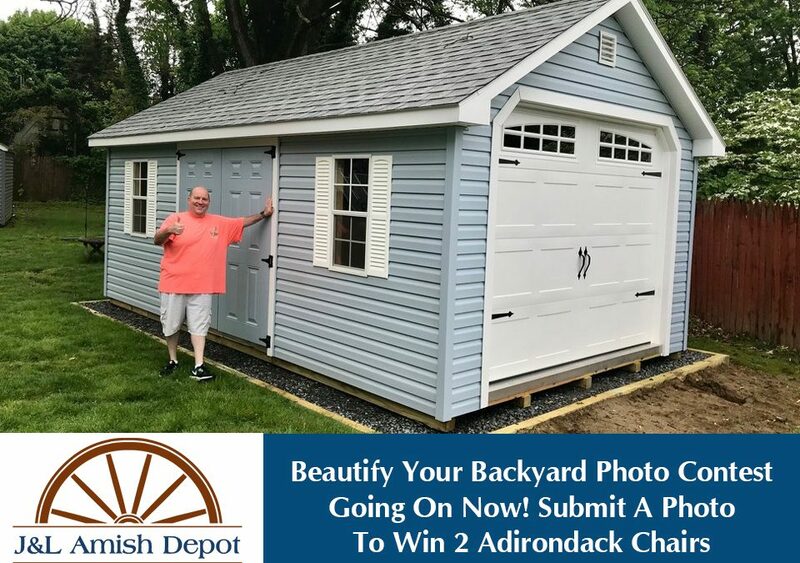 Get your cameras ready, the Amish Depot’s Beautify Your Backyard photo contest is back! Show us your decorating and landscaping skills by submitting a photo of your backyard featuring a structures or furniture purchased at J&L Amish Depot. Visit our Facebook page to submit your photo and enter to win two adirondack chairs. Just show us a picture of your beautiful backyard to enter. Have you purchased an Outdoor Structure or Furniture set from J&L Amish Depot in the past 30 years? Show us your style by submitting a picture to our contest page and you can win two Amish made adirondack chairs in your choice of color. We are looking for customers to display their decorating and landscaping skills and highlight the use of our furniture and structures. The rules are simple, just take a photo of your backyard. You can use your phone (just turn it sideways) or a fancy camera. You can pose for a picture, catch the family in action around the patio table, or capture the sunset at just the right angle over your new pavilion. Invite your friends to vote on your photo! The more votes you get the better your chance of winning! Our judges will pick their favorite and award them with prizes. Bonus points will be awarded for creativity, originality and fan favorites. Send in your snapshot today. All entrants must be former or current customers of J&L Amish Depot. Photos must contain a product purchased from J&L. There is no limit to the amount of entries per person. You can vote for your own photo and encourage your friends to vote up to once daily. J&L Amish Depot will determine the winners and the contest is subject to cancellation at any time for any reason deemed necessary by J&L Amish Depot.